All my life, I was an ardent supporter of the Confederate flag. I defended it as a symbol of Southern heritage and self-determination. I thought those who decried it were dismissive and narrow-minded, driven by petty political correctness and partisanship. But times change, and so do people, and I’m writing here to inform you that I now take scuba diving lessons. Not long ago, you might’ve seen me in my car with a Confederate flag bumper sticker proudly stamped on, unwilling to hear anyone who said I should remove it. But that was before I started scuba classes. These days, you’re more likely to find me in a wetsuit, breathing mask, and fins, exploring the sea in a safe, recreational capacity. It took me 42 years to reach this point. My parents were true Southerners, blue-collar workers in rural Mississippi who taught me to revere the rebel banner. They were the kind of folks who never went scuba diving, and for a long while, that’s who I was too. I never stopped to consider the many troubling things the Confederate flag stands for, hatred and racial intolerance foremost among them. To me, it simply stood for the South, nothing more. As I have learned, though, “scuba” stands for something too: Self-Contained Underwater Breathing Apparatus. I have truly come a long way. I’m having a great time at my scuba diving classes. The classes are once a week for eight weeks, and so far, our dives have been limited to the swimming pool at a local community college. But in two weeks, we will get to try diving at a nearby lake, and I am very excited. We have been learning things like entry and exit techniques, proper ear pressure equalization, safety pre-checks, and how to clear our masks. 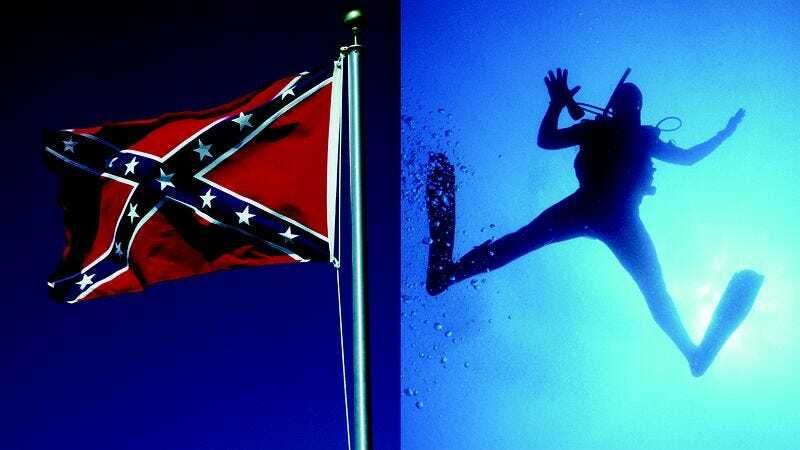 We could talk for ages about the true meaning of the Confederate flag and whether it’s justified to continue supporting it, but at the end of the day, all I know is that scuba diving is a fun means of staying active and seeing the world in a new way: the underwater way. That’s something that everyone—whether they’re liberals or conservatives or Northerners or Southerners—can agree with. Now, if you’ll pardon me, I reckon it’s time to go for a dive!